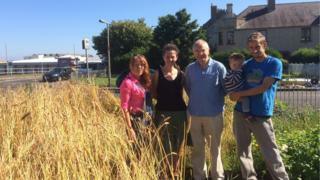 Wheat is being grown in urban street corner plots in Edinburgh for communities to mill and make bread. A group of bakers, community gardeners and farmers are trying to establish a healthier Scottish flour. Their crop trials are being run in Granton on land that had originally been set aside on street corners for communities to grow crops. They are now using the land again after it had become derelict in recent decades.